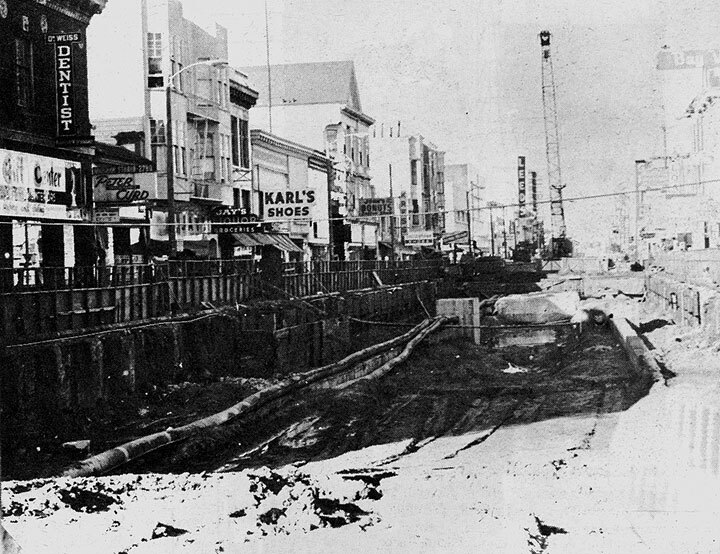 When BART was built along Mission St, it was one of the first times a tunnel boring machine was used in America. (The construction history of BART is covered in utterly fascinating detail in this report preserved by Richard Mlyarick.) However, the stations were constructed by digging a giant hole, and then covering it back up. 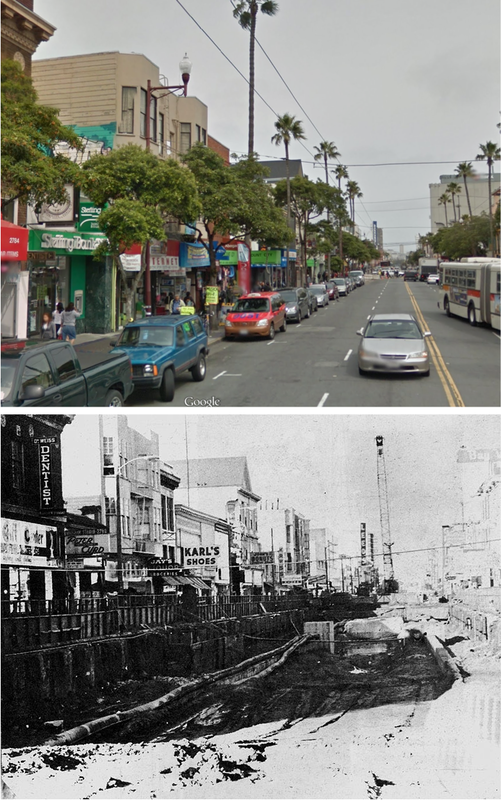 Here’s a photo looking north from 24th in the very 1970s via the esteemed FoundSF. A quick detour in which we play “what’s that sign“: Jay’s Liquor & Groceries is now painted a lovely shade of blue. I can only imagine how that went down. While it doesn’t cover the Mission, this 1968 BART construction video is a classic. Oh the music! I am sure that during BART station construction people and businesses around 24th & 16th were upset, though I suspect the inconvenience of construction were outweighed by demographic changes and the suburban flight that were already well underway. For example, while Karl’s Shoes didn’t make it past 1972, but John’s Do-Nut & Coffee lasted until at least 1982. “What else do the urban designers forecast? They see Mexican palm trees every 26 feet. An “historic” walkway up 16th to Mission Dolores lined with Taco stands and stores that sell genuine made (on Valencia St.) blankets and souvenirs. @burritojustice Ha! Never remember them being chased out. I remember them never wanting to go in. It was rare to white folks in El Farolito. @guero310 @burritojustice it was rare in the mid nineties even. @burritojustice I disagree. Mom, sis & I regularly went to la taqueria when we were kids in the 80s. Shopped on mission st., etc. And while we’re on the subject, in 1981, proto-Farolito was Manuel’s, and in 1982 it had changed to El Zunzal. This of course gets into the future of transit. The recent acquisition of Safeway by Albertson’s got people on my Twitter feed talking about how to better use the massive parking lots. This usually came down to copying the Whole Foods model, with groceries below and apartments above. When BART was thinking about the 30th St infill/pocket station, the La Lengua Safeway parking lot was key in the construction plans. The obvious conclusion is to convert EVERY Safeway, Whole Foods and Trader Joe’s in the city to a subway station and connect them with tunnel boring machines. 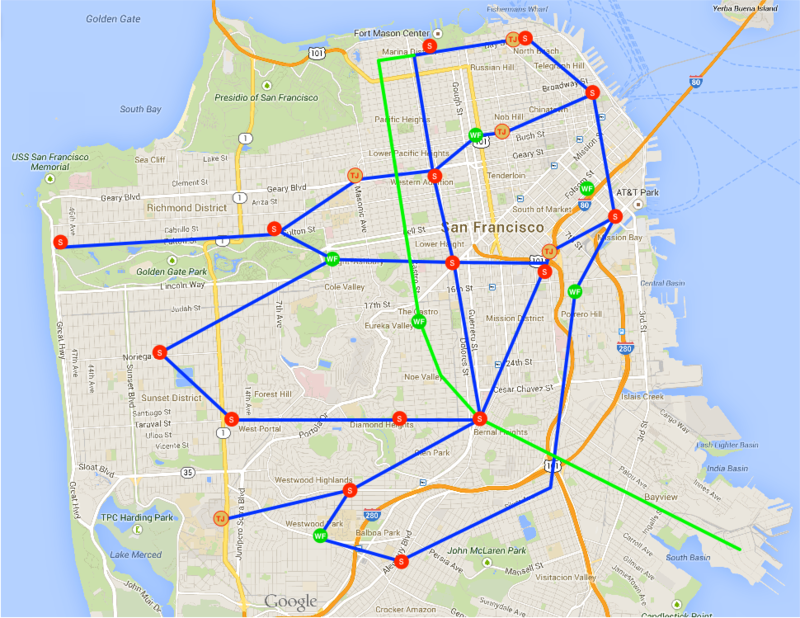 This would quickly create a pleasing and most practical transportation network for San Francisco. So don your hard hats, put on the reflective vests, and get thee to a tunnel boring machine! 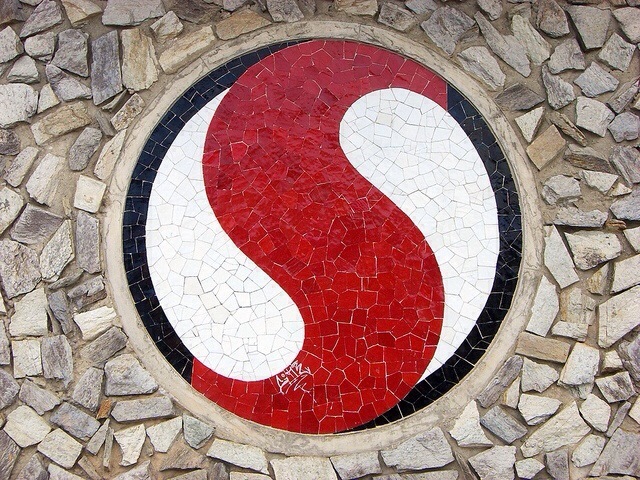 But of course, we all know what the symbol for the new subway would be. 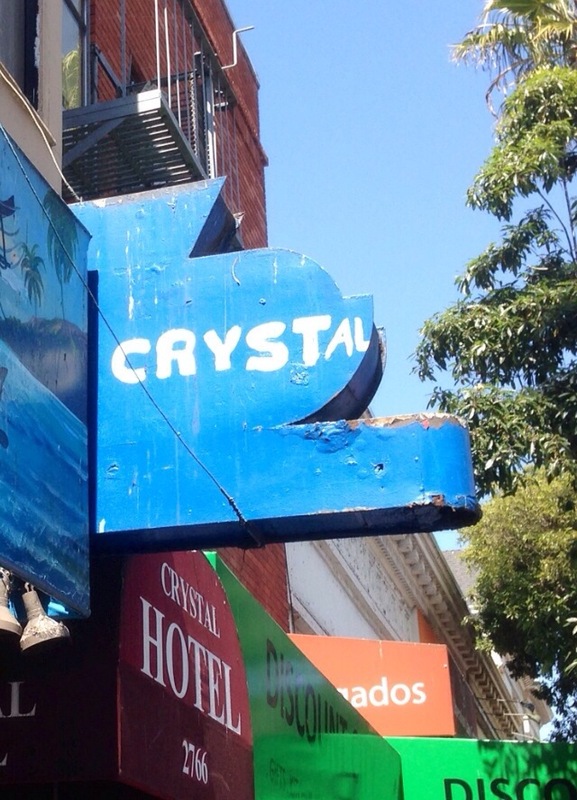 As a techie anglo gentrifier who’s live in the Mission since ’81, I’d say its true that many of my friends were too chicken to come visit in the Mission back in the ’80s, and there was a real demarcation where the same chickens were really unwilling to venture east of Mission Street, or anywhere down 24th. Their fears, especially for our gay friends, were not baseless. 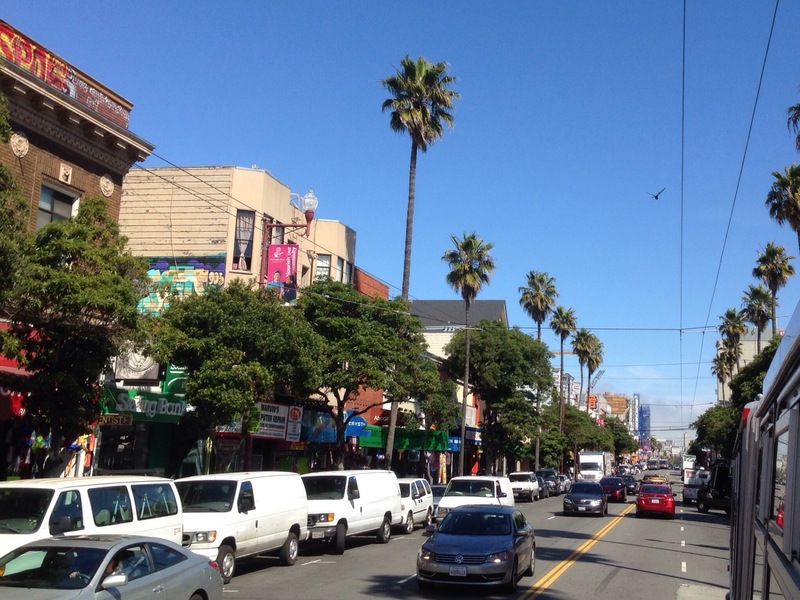 Youths hanging on 24th street could be pretty menacing, with a heavy dose of homophobia — up until relatively recently. But it was definitely not true that there were none of us, or that we were chased out of the hood. Far from it. There seem to be no modern maps anymore that indicate the exact location of underground structures. Thanks, 9/11. I have wondered this, too! When I get on at BART, I almost feel like it’s just magic that I arrive anywhere else. I’ve wondered if they put that information in real estate disclosures, though? As an aside, my better half and I refer to the 30th Street BART station as if it’s already built, or about to be. Added some of the construction history. But anyway, even out in Contra Costa County, my understanding is that there was a lot of concern about the changes that BART would bring, but people were mostly super excited about the prospect of getting to SF without having to drive 25 miles! Does the person who wrote this live in Bernal Heights or what? That 30th St hub makes it look like the center of all SF. You say that as if it weren’t. Reblogged this on beauty of nathure. Any idea how the section from Market connecting to Mission was tunneled? I know it goes directly under some buildings that are older than the tunnel. Oops, yeah. Bay View. Thanks. Take a look at that engineering report I link to, think it’s in there. I will say that “S” symbol for the subway bears a strong resemblance to the logo of the Berlin S-bahn.